The Project: There was an AT&T project where my department was supposed to add a 611 number to the Usage webpage. The Challenge: I disagreed with the project’s objective. It was confusing to have a 611 number on the page without explanatory text/a tooltip. 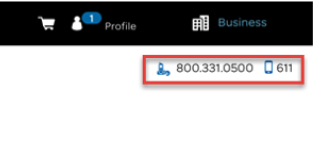 Without an explanation, there was no way for the user to know 1) what the 611 number was for and 2) that selecting 611 only works from an AT&T wireless device if you want to reach AT&T customer service. For example: If I click 611 from my T-mobile device, I would get T-mobile’s customer service instead of AT&T’s, which is not what AT&T users want. Plus, it didn’t make sense to have a 611 number listed in the first place because this website change was for desktop only. You can only click on the numbers listed on the site through the mobile site. The Solution: I set up a call with the Head Writer, the Lead IA, and content writers from other departments. We agreed that this project’s objective didn’t benefit the user. Then, I set up a call with the business team and everyone from the first call and in the end we all agreed that we wouldn’t pursue the project further for the sake of having a great user experience. The Project: The Usage page underwent a massive redesign to make sure it was visually consistent across all devices. The Challenge: We needed to simplify the navigation while retaining user access to more complicated information. The Solution: My team and I decided to add dropdown text to the Usage webpage to help users easily access information about how they were using their devices. I made sure that the dropdown content used actionable language—view, see, and manage—so that the purpose of these links were clear to the user.